The park is named after the giant Saguaro Cactus, which grows in abundance around the Tucson, Arizona area. In addition to these giant cactuses, the park is also home to roughly 1,160 other plants. This includes a plethora of other beautiful cactus species. The park is also home to an amazing assortment of reptiles, birds, and mammals, which includes the famous roadrunner bird. In this guide, I am going to give you all of the information that you need to ensure your trip to Saguaro National Park is a success. I will outline how to get to the park and what times of the year it is best to visit. I will also discuss the best places to stay while you are visiting the park and what activities I recommend you check out in the area. Finally, I will give you a list of some of my favorite things to see and do in Saguaro National Park. Saguaro National Park is located in the Southern part of the state of Arizona, close to the border with Mexico. The park is divided up into the East and West District by the city of Tucson, Arizona, which sits right in the middle of the two districts. This makes Tucson, Arizona the best place to use as your base of operations while exploring Saguaro National Park. Tucson is also the most convenient place to fly in-and-out of if you are visiting the area from outside the state or outside the country. 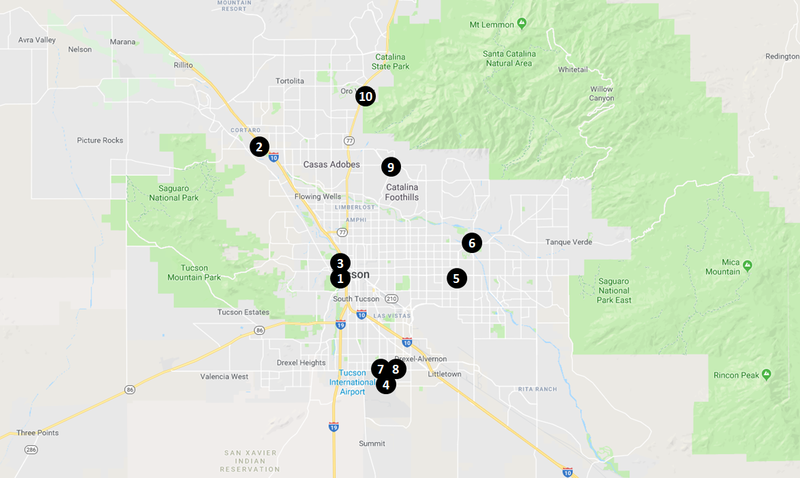 If you are looking to combine a stop in the Tucson area with other areas of the American Southwest, there are a number of other cities in the region that you can fly in-and-out of as well. If you are interested, I listed a table of these cities above for your review. When I was exploring the American Southwest a few years ago, I flew in-and-out of El Paso, Texas. In that trip, I was able to visit a number of the park in Texas, New Mexico, and Arizona all in one trip. If you are interested in seeing an itinerary of this trip, please check out my Epic National Parks Road Trips – Desert Mountains and Caves Road Trip article for more information. 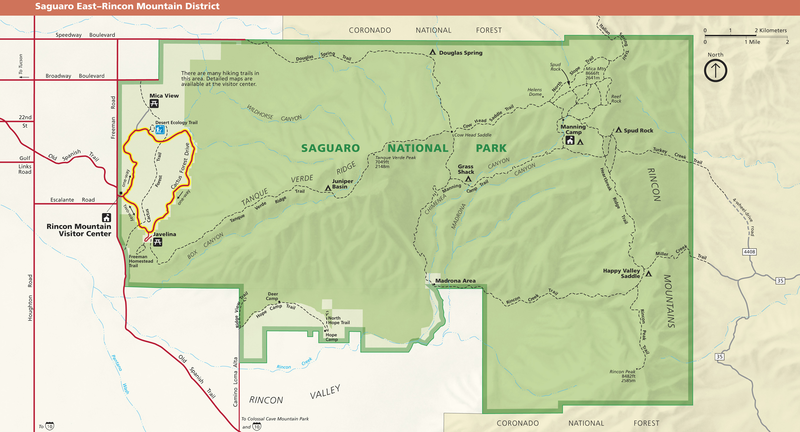 The Eastern District of Saguaro National Park is the larger of the two districts of the park. This district includes the section of the park that sits in the Rincon Mountains. This section of the park ranges from 2,670 ft to 8,666 ft in elevation and includes both desert scrub as well as forested areas. Because of the higher elevation and wooded areas in this section of the park, you have a better chance of seeing animals like the black bear, Mexican spotted owl, Arizona mountain king snake, and white-tailed deer in this part of the park. I have included a map below of the Eastern District for you to review. The Western District of Saguaro National Park is both smaller and younger than the Eastern Section of the park. However, just because it is younger and smaller doesn’t mean that this section of the park is any less impressive. This section is at a lower elevation than the Eastern section of the park, with a top altitude of roughly 4,687 feet at Wasson Peak, so the wildlife you will see in this section of the park is different than what you will see in most parts of the Eastern District. In addition to the park’s many snakes and reptiles, you have your best chance of seeing the park’s roadrunners in this section of the park. 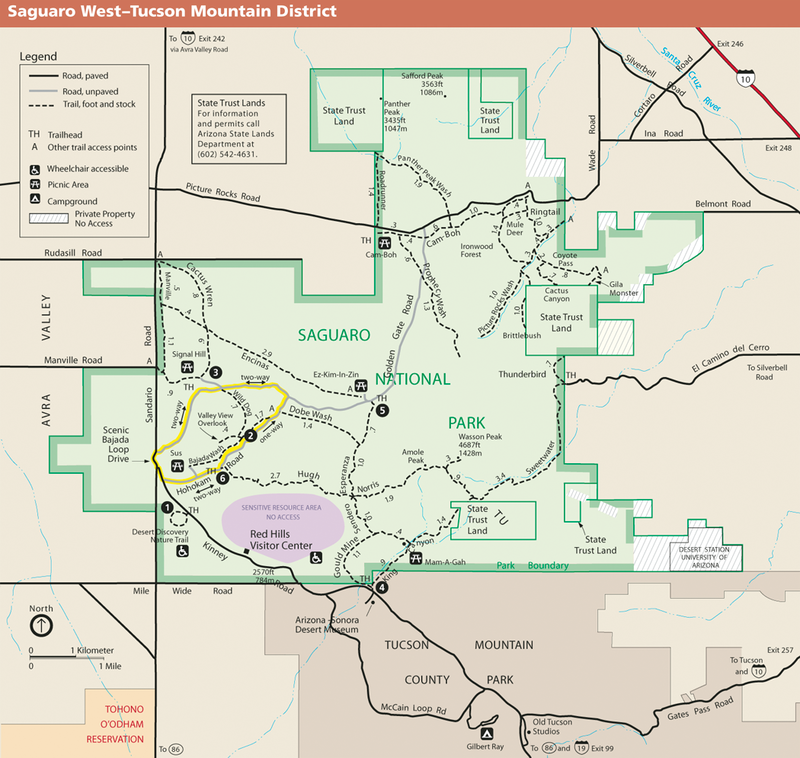 I have included a map of the Western District of Saguaro National Park for you to review below. When determining the best time for you to visit Saguaro National Park, there are a number of factors that you will want to keep in mind. These factors include the average temperature in the park throughout the year, the amount of precipitation the park gets during different times of the year, and the number of other visitors that you can expect to find in the park at different times of the year. My Recommendation: If you take all of the factors below into account, I think the best time to visit Saguaro National Park is in the late autumn or early winter months of October and November. During these months the daytime temperatures are not unbearably hot and the nighttime temperatures are still rather warm. In addition, these are relatively dry months so you won’t have to worry about rain ruining your hiking plans. Most importantly, this is just before the winter months where attendance balloons, so you won’t have to worry about crowds on the roads and trails. Because it is a desert park in the far Southwestern part of the United States, you can expect temperatures in Saguaro National Park to be very hot during the summer months. In fact, temperatures can be pretty miserable during the months of June thru August. While nighttime temperatures can be fairly cool during the winter months of December thru February, they aren’t too cold to warrant avoiding the park at this time of year. From a temperature standpoint, the ideal times of year to visit are undoubtedly the Spring and Autumn months of March thru May and September thru November. During these periods you will avoid the miserably hot temperatures that the park sees during the summer, but you will still get to enjoy relatively warm low temperatures at night. Being a desert park, the amount of rain that Saguaro National Park gets overall throughout the year is very minimal. However, there are certain months throughout the year where rainfall is much more abundant than the rest of the year. While the spring and early summer months of April thru June see very little rainfall, the summer months of July and August typically have more rainfall than during any other time of year. The final factor that is important to consider when planning a trip to Saguaro National Park is the number of other visitors that you can expect to encounter when you visit. If you want to avoid the congestion, the lowest visitation the park sees is during the summer and early autumn months of June thru September. The highest visitation is undoubtedly in the winter and early spring months of January thru March. In addition to the amazing things that you can see inside and around Saguaro National Park, there are some other really cool things in the area that are worth seeing. I outline a few of my other favorite places in the Tucson area below for you to review. If you are fascinated by caves, then you will absolutely love Colossal Cave Mountain Park, which sits about 30 minutes southeast of Tucson. This beautiful crystal filled cave has been used as a refuge by humans for thousands of years and is amazing to explore. You can take a guided tour of the cave and learn all about this amazing wonder. One of my favorite activities in the area that is outside the park is the Pima Air and Space Museum. If you like airplanes, then this is a must-see attraction. It is one of the world’s largest non-government funded aerospace museums and has over 300 aircraft on display over the 80 acres of museum property. When visiting Saguaro National Park, there are a number of excellent campsites inside the park that you can enjoy. However, if you aren’t interested in camping, the best place to set up your base camp is in the nearby city of Tucson, Arizona. To assist you in finding the right place to stay, I have included some hotel recommendations at different price points below for you to review. In order to assist you in getting the most out of your trip as possible, I have included links to a number of different park resources for you to review below. In addition to this guide, these resources should provide everything you need to make your trip to Saguaro a success. In addition to visiting the park, there are a number of excellent outdoor activities that you can enjoy within the park and in the surrounding areas. I have included a list of just some of those activities for you to review below. There is no shortage of beautiful things to see and exciting things to do within Saguaro National Park. To give you a head start in planning out your time in the park, I have listed some of my favorite things to see and do for you to review below. The Valley View Overlook Trail is a great short hiking trail that will take you into the interior of the Western District of Saguaro National Park. This 0.8-mile out-and-back trail takes you thru some of the parks larger Saguaro cactuses and allows you to get up-close-and-personal with some of the desert’s wildlife. The Bajada Loop Drive is the primary driving road thru the Western District of Saguaro National Park. This drive will take you thru the areas with some of the larger Saguaro cactuses in the Western District and includes a number of scenic pullouts that you can stop at to take pictures and enjoy the beautiful landscape. Saguaro National Park is home to an amazing assortment of both desert and mountain wildlife. Inside the park, you have a chance to see reptiles like horned lizards, Gila monsters, and desert tortoises, as well as mammals such as mountain lions, black bears, and white-tailed deer. For bird enthusiasts, Saguaro National Park is a birdwatcher’s paradise. In addition to the famed roadrunners that live in the park, the park has a wide assortment of other birds that can be spotted. This includes woodpeckers, hummingbirds, quail, and a variety of birds of prey. In the Eastern District of the park, the main road that takes you thru the park is the Cactus Forest Drive. Just like the Bajada Loop Drive in the Western District, the Cactus Forest Drive allows visitors to get closer to the beautiful scenery and wildlife in the park without having to leave their car. There are a number of scenic pullouts along the drive for taking pictures and enjoying the serenity of this beautiful place. For the visitors who love history, the ancient petroglyphs that can be found in the Western District of the park are a remarkable find. These ancient petroglyphs are amazingly well preserved and give a historical account of the human habitation in this region dating back thousands of years. These petroglyphs can be found in rocky spots throughout the entire American Southwest and are well preserved in the United States National Parklands. No visit to Saguaro National Park is complete without taking a picture of yourself next to one of the giant Saguaro cactuses. These cactus can be as tall as a telephone pole, but it is really hard to visualize just how big that is without seeing some perspective. It is amazing to see pictures of people next to the cactuses because we are absolutely dwarfed by these gigantic and beautiful plants. As you can see in the picture to the right, I look absolutely tiny next to this gigantic cactus and I am 6’2″ tall. If you are lucky enough to visit the park during the spring months, you should have no problem finding cactus flowers to admire and photograph. The Prickly Pear cactus bloom in early May, while the Saguaros typically bloom from mid-May to mid-June. However, if you are lucky, you can still see cactuses in bloom into the Summer and even autumn months on occasion. If you are lucky enough to be able to spend several days around the park, I would highly recommend that you visit the park around sunset to get some sunset pictures of this beautiful landscape. My favorite place in the park to visit for sunsets is undoubtedly Hugh Norris Trail in the Eastern Section of the park. This beautiful trail has some absolutely breathtaking vistas that look stunning at sunset. Saguaro National Park is almost limitless in its beauty. There are photo opportunities around virtually every bend in the trail. Below is a gallery of just some of the beautiful pictures I was able to take while visiting Saguaro National Park. Great post. I need to get back out there with the husband. I was at Saguaro NP 20+ years ago, but I’d like to get back again. I was in Tucson 2 years ago but was carless so I couldn’t get there. Instead I hiked the Santa Catalinas, which was nice. Beautiful pictures, as always. Thanks for the kind words, as always! I hear the Santa Catalinas are beautiful! !